Immune recovery in lymphopenic hosts depends largely on homeostatic peripheral expansion, especially when thymopoiesis is insufficient, as is often the case in human adults. Although it has been well studied in mice, the study of homeostatic peripheral expansion of human T cells has been limited by the lack of an appropriate in vivo model. In this study, we use T cell-deficient humanized mice and an adoptive transfer approach to demonstrate that two distinct proliferative responses of autologous T cells occur in vivo in a lymphopenic setting. Human naive CD4 and CD8 T cells that undergo rapid proliferation acquire a memory-like phenotype and the ability to rapidly produce IFN-γ, whereas those undergoing slow proliferation retain naive phenotypic and functional characteristics. Recovery of both populations depends on the extent of human non-T cell chimerism in the periphery of recipient humanized mice. Furthermore, memory conversion of CD4 and CD8 T cells correlates with the level of human CD14+ and CD19+ chimerism in recipient mice, respectively, suggesting that different types of APCs support memory conversion of CD4 and CD8 T cells. Because lymphopenia affects clinical outcomes, this model, which will allow detailed investigation of the effects of lymphopenia in patients, is of clinical significance. Many treatments and conditions induce T cell lymphopenia in humans. These include chemotherapy for cancer, T cell-depleting immunosuppressive therapy for transplantation, infections (e.g., HIV), and aging. T cell immune function may remain compromised even after normal lymphocyte numbers have recovered in lymphopenic patients (1). At the same time, recent studies have suggested that lymphopenia induced by lymphoablative treatment provides a unique opportunity for effective antitumor immunotherapy and can enhance tumor-specific T cell responses, as shown in murine (2, 3) and human studies (4). Therefore, an understanding of the processes of immune reconstitution that follow lymphopenia is of clinical importance. The process of T cell reconstitution in lymphopenic hosts is believed to include a thymus-dependent pathway and a homeostatic peripheral expansion (HPE) pathway. The thymus-dependent pathway relies on renewal of thymopoiesis in an often atrophic thymus. Thus, HPE affects immediate reconstitution, whereas the thymus-dependent pathway may not fully impact on reconstitution for 1 to 2 y and may occur only in individuals under 40–49 y of age (5). The contribution of HPE to immune reconstitution in thymectomized hosts is larger and more long lasting than in euthymic hosts (6). Therefore, immune recovery in lymphopenic hosts depends largely upon HPE, especially when thymopoiesis is insufficient, as is often the case in human adults. In mice, HPE results in rapid expansion of T cells and is associated with conversion from naive to memory-like phenotype (7) and development of effector functions, such as IFN-γ secretion (8, 9). MHC interactions (10, 11) have been shown to promote HPE of both CD4 and CD8 cells, and CD28 ligation (8, 11) has been shown to be critical to HPE of CD4 cells. Furthermore, HPE of mouse T cells involves both slowly proliferating cells, which are dependent upon IL-7, and rapidly proliferating cells, which require TCR-dependent Ag recognition of commensal microflora (9, 12). In vivo studies of HPE have been thus far limited to the mouse system due to the technical obstacles to performing such studies in humans. Although many human studies (13–15) indirectly support observations from murine models, it has thus far been impossible to distinguish whether the enrichment for memory-type T cell recovery in lymphopenic humans reflects relative resistance of memory cells to the treatments that induce lymphopenia (Abs, irradiation, chemotherapy, etc.) or conversion of naive T cells to the memory phenotype, as occurs in the mouse model (7). Therefore, in vivo models to study human T cell homeostasis are needed. Humanized mice have been widely used to study the function of human immune cells (16–18). They are created by reconstituting immunodeficient mice, such as those with the SCID mutation and their derivatives, including NOD/SCID, with human hematopoietic cells. A commonly used mouse model for the study of human thymopoiesis and T cell development has been the human-SCID mouse model, in which SCID mice receive a transplant of human fetal thymus (Thy) and liver (Liv) tissue. This model has been successfully applied to studies of the biology of human thymopoiesis and HIV infection of human T cells (19–21). However, these mice lack efficient peripheral repopulation with multilineage hematopoietic cells and fail to mediate effective immune responses in vivo, even though human thymopoiesis is achieved, and human T cells from these mice are functional in vitro. Recently, our group has demonstrated that the addition of an infusion of human CD34+ fetal liver cells (FLCs) from the same donor to human fetal Thy/Liv transplant recipients permits the reconstitution of a functional human immune system in NOD/SCID mice. Strong Ag-specific in vivo immune responses are observed (22–24). Mice receiving human Thy/Liv/CD34+ FLCs show peripheral repopulation with multilineage human hematopoietic cells, including T cells, B cells, and, most importantly, dendritic cells (DCs), which have an important role in the HPE in mouse models (25, 26). This humanized mouse model was used with a CSFE-based cell transfer technique to allow systematic in vivo analysis of human HPE. The results of such studies are reported in this paper. NOD/SCID mice were housed in a specific pathogen-free microisolator environment and used at 6–10 wk of age. Human fetal thymus and liver tissues of gestational age 17–20 wk were obtained from Advanced Bioscience Resource (Alameda, CA). Protocols involving the use of human tissues and animals were approved by the Massachusetts General Hospital Human Research Committee and Subcommittee on Research Animal Care (Boston, MA), and all of the experiments were performed in accordance with the protocols. NOD/SCID mice were conditioned with sublethal (2.5 Gy) total-body irradiation. Human fetal thymus and liver fragments measuring ~1 mm3 were implanted together under the recipient kidney capsule. CD34+ cells were isolated from the same fetal liver, and 1–5 × 105 CD34+ human FLCs were transplanted i.v. within 24 h. CD34+ FLCs were isolated with the MACS separation system using anti-human CD34 microbeads (Miltenyi Biotec, Auburn, CA). Some mice received only CD34+ FLCs from the same donor without human fetal thymus and liver implantation and were later used as secondary T cell-deficient recipients of adoptive transfer. Eighteen to 20 wk posttransplantation, we prepared naive (CD45RO−) human T cells from spleen and peripheral lymph nodes (LNs; axillary, mandibular, inguinal, and cervical) of donor humanized mice using the MACS system. Briefly, splenocytes and LN cells were harvested, and murine cells were depleted using anti-mouse CD45 and Ter119 microbeads (Miltenyi Biotec). Human naive T cells were isolated by negative selection using the human Pan-T cell isolation kit II and anti-human CD45RO microbeads (Miltenyi Biotec). The purity of human naive T cells was usually >97%. Human naive T cells were then labeled with CFSE (Molecular Probes, Eugene, OR), and 2 × 106 labeled cells were transferred into secondary T cell-deficient recipient mice. Five and 14 d after adoptive transfer, LN and spleen cells were harvested. Harvested splenocytes and LN cells were pooled from each individual mouse, and RBCs were lysed with ACK lysis buffer. Total cell number in each sample was counted, and cells were analyzed by flow cytometry (FCM). We assessed the levels of human hematopoietic cell repopulation in the mice that underwent transplantation and the profile of donor cells in adoptive transfer experiments by FCM analysis. The following mAbs, purchased from BD Pharmingen (San Diego, CA), were used in different combinations: anti-mouse CD45 (30-F11), anti-mouse Ter119 (Ter-119), anti-human CD4 (RPA-T4), anti-human CD8 (RPA-T8), anti-human CD14 (M5E2), anti-human CD19 (HIB19), anti-human CD45 (HI30), anti-human CD3 (SK7), anti-human CD45RA (HI100), anti-human CD45RO (UCHL1), anti-human CD25 (M-A251), anti-human CD69 (FN50), anti-human CCR7 (3D12), APC streptavidin, PE-Cy7 streptavidin, and isotype control mAbs. All samples were acquired using an FACSCalibur or LSR II (BD Biosciences, Mountain View, CA) flow cytometer, and analyses were performed by FlowJo software (Tree Star, San Carlos, CA). Dead cells were excluded from the analysis by gating out cells with low forward scatter and high propidium iodide- or 7-aminoactinomycin D-retaining cells. For in vitro stimulation and following intracellular cytokine staining, human T cells were isolated from splenocytes and LN cells of secondary adoptive recipients by negative selection using anti-mouse CD45 microbeads, Ter119 microbeads, and the human Pan-T cell isolation kit II with an LD column to obtain high-purity (>95%) human T cells. Isolated human T cells (105/well) were incubated in flat-bottomed 96-well plates in AIM-V medium containing 10% human AB serum with PMA (20 ng/ml), ionomycin (1 μM), and brefeldin A at 37°C in 5% CO2 for 4 h. Harvested cells were washed twice in wash buffer, and surface Ags were stained with Abs. The cells were then fixed and permeabilized with the Cytofix/Perm kit (BD Pharmingen), followed by incubation with anti-human IFN-γ (B27) or mouse IgG isotype mAb. All samples were acquired using an LSR II (BD Biosciences), and analyses were performed with FlowJo software (Tree Star). Statistical analysis and comparisons were performed with Prism software version 4.0 (GraphPad, San Diego, CA). Data in bar graphs are expressed as mean ± SEM. Fitted lines were calculated by linear regression. Statistical analyses were performed using Pearson’s correlation coefficient test. Student t test with Welch’s correction, paired t test, one-way ANOVA, and two-way ANOVA were used to compare groups. A p value <0.05 was considered to be statistically significant. Previous studies have shown that combined human fetal Thy/Liv grafting under the kidney capsule with i.v. administration of CD34+ FLC leads to multilineage human hematopoietic repopulation, including T cells, in 2.5 Gy-irradiated NOD/SCID mice. The thymic graft is critical for the achievement of T cell repopulation in this model, and the i.v. administration of CD34 cells, which allows markedly increased reconstitution of various human APC populations in the periphery, leads to markedly improved T cell repopulation of peripheral lymphoid tissues (22). We hypothesized that the human APCs repopulating the periphery of animals that also received CD34 cells i.v. were helping to promote the survival and homeostatic expansion of human T cells developing in the human thymic grafts. To develop a model in which to address this possibility, we generated NOD/SCID mice that contained human APCs without T cells. These mice were generated by administering fetal liver CD34+ cells i.v. to 2.5 Gy-irradiated NOD/SCID mice that did not receive a Thy/Liv graft. As shown in Fig. 1A and 1B, humanized mice receiving human fetal Thy/Liv grafts and CD34+ FLCs i.v. showed excellent multilineage human hematopoietic cell repopulation, including CD3+ T cells in peripheral blood. In contrast, humanized mice receiving only CD34+ FLCs i.v. from the same human donor showed sustained multilineage human hematopoietic repopulation without any measurable CD3+ T cells. The proportion of human B cells in humanized mice receiving human fetal Thy/Liv grafts and CD34+ FLCs i.v. was significantly lower than that in humanized mice receiving only CD34+ FLCs i.v. at late time points (16 wk and 20 wk), most likely due to dilution by increased numbers of human T cells in the periphery in the former group at those time points. Interestingly, the proportion of human CD14+ monocytes in humanized mice receiving human fetal Thy/Liv graft/CD34+ FLC was significantly higher at 20 wk than that in humanized mice receiving only CD34+ FLCs (Fig. 1B). This result suggests that T cells may promote CD14+ monocyte expansion, survival, or development through bidirectional signaling, as has been shown in human and mouse models (27, 28). Of note, we detected no evidence of any human thymopoiesis in the native murine thymi of NOD/SCID mice receiving CD34+ FLC either with or without human fetal Thy/Liv grafts at any time point (data not shown). Thus, NOD/SCID mice receiving CD34+ FLCs i.v. without Thy/Liv grafts provided a model of T cell deficiency in which to assess T cell homeostasis following adoptive transfer. Transplantation of only CD34+ FLC without Thy/Liv produces T cell-deficient humanized mice with repopulation by multilineage human hematopoietic cells in NOD/SCID mice. NOD/SCID mice that received Thy/Liv/CD34+ FLCs (open bars, n = 9) or CD34+ FLCs only (closed bars; n = 14) were bled to measure human chimerism in PBMCs at the indicated time points. A, Representative FCM profiles of PBMCs from normal human, normal C57BL/6 mouse, and humanized mice that received indicated treatments are shown. Blood samples of humanized mice were obtained 20 wk posttransplantation. Single-cell suspensions of PBMCs were stained for markers of human hematopoietic cells (CD45), T cells (CD3), B cells (CD19), and monocytes (CD14). Dead cells and murine erythroid cells were excluded from the analysis by gating out low forward scatter and high propidium iodide-retaining and anti-mouse Ter119-positive cells. B, Kinetics of human CD45+, CD3+, CD19+, and CD14+ cell levels in PBMCs. All data are expressed as mean ± SEM. Experiments were repeated three times with similar results. ***p < 0.001 compared with NOD/SCID mice receiving CD34+ FLC only at each time point (two-way ANOVA, Bonferroni posttest). In mice, two distinct types of proliferation occur upon transfer of naive CD4 T cells into RAG2−/− or neonatal mice (9, 11). One cell population undergoes rapid proliferation characterized by complete dilution of CFSE within a 7-d period and acquisition of effector/memory cell properties, whereas another population of T cells undergoes slow division during the week following transfer. To analyze lymphopenia-driven proliferation of human T cells in vivo, we used an adoptive transfer approach with CFSE dye dilution. Two million MACS-sorted CD45RO− naive human T cells isolated from spleens and LNs of Thy/Liv-grafted/CD34+ FLC recipients were labeled with CFSE and transferred into T cell-deficient humanized mice that had received CD34+ cells from the same human fetal donor without a Thy/Liv graft and established human hematopoietic repopulation without T cell development. Recipients were sacrificed 5 or 14 d posttransfer, and the CFSE profile of transferred T cells from spleen and LNs was analyzed. A significant fraction (8%) of the transferred cells had divided ≥7 times as early as 5 d posttransfer. In addition to this rapidly proliferating cell population, a smaller number of T cells remained undivided or had divided only once by this time (Fig. 2). By day 14, a slowly proliferating cell population was detected that had undergone six or fewer divisions as well as a rapidly proliferating cell population, which is defined by ≥7 divisions based on CFSE intensity (Fig. 2). These results suggest that naive human T cells, like those of the mouse, show two distinct types of proliferation when they are introduced into a T cell-deficient environment. Proliferative patterns of naive T cells upon transfer into T cell-deficient secondary recipient humanized mice that received only CD34+ FLCs from the same human fetal donor. Naive human (mouse CD45−Ter119−, human CD45RO−) T cells were isolated from spleen and LNs of donor humanized mice that had received Thy/Liv/CD34+ FLC transplantation 20 wk earlier, CFSE labeled, and transferred (2 × 106/mouse) into T cell-deficient recipient humanized mice that had received only CD34+ FLCs from the same human donor. Recipient mice were sacrificed 5 or 14 d posttransfer, splenocytes and LN cells were pooled from each individual mouse, and CFSE profiles of transferred cells were analyzed by FCM at each time point. 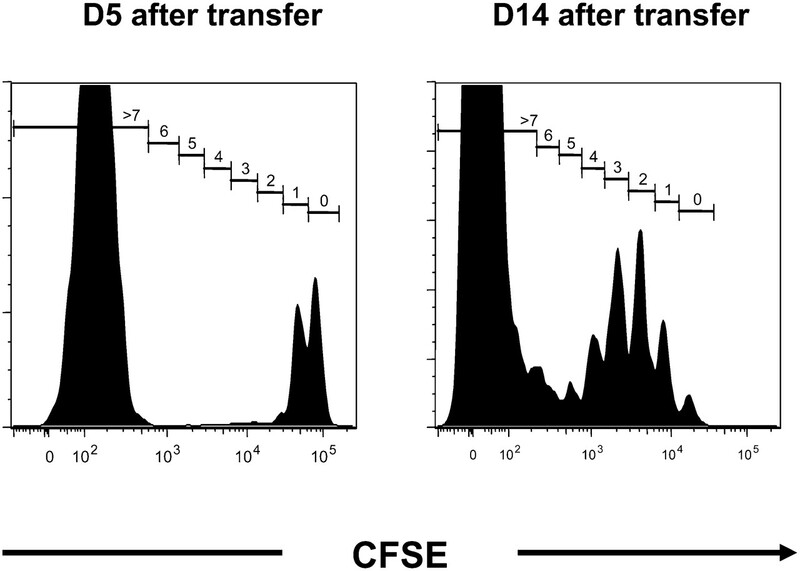 Figures from two representative recipient humanized mice that had 56.5% human chimerism level (human CD45+) among PBMCs at the time of transfer are shown (left panel, sacrificed on day 5 posttransfer; right panel, sacrificed on day 14 posttransfer). Mouse CD45+ or Ter119+ cells were excluded from analysis, and human CD3+ cells were gated. Experiments were repeated three times with similar results (>5 mice were used for each experiment). We next analyzed human T cell recovery in T cell-deficient humanized mice by administering 2 million naive autologous human T cells from spleens and LNs of Thy/Liv-grafted/CD34+ FLC-recipient humanized mice. As shown in Fig. 3A, the lymphoid tissues from a T cell-deficient humanized mouse with a high level of human chimerism (78.4% human CD45+ cells in total PBMCs) contained clearly detectable human T cells (2.94% CD4 and 0.23% CD8 T cells, respectively) 14 d posttransfer. In striking contrast, the lymphoid tissues of a control NOD/SCID recipient mouse (0% human CD45+ cells in total PBMCs) showed almost no persisting human T cells following adoptive transfer (0.002% CD4 and 0.019% CD8 T cells, respectively). When T cell recovery in adoptive recipients was plotted against the level of human chimerism at the time of transfer, a strong, direct correlation was detected for both CD4 and CD8 T cell recovery (Fig. 3B). These results indicate that human non-T cells are required in the periphery of T cell-deficient mice to support the expansion of human CD4 and CD8 T cells, consistent with the hypothesis that interactions with human APCs are critical for the expansion and possibly survival of transferred human T cells. The recovery of transferred naive T cells is supported by human cells in the periphery of recipient T cell-deficient humanized mice. Adoptive recipient mice (n = 6) were sacrificed 14 d posttransfer of donor naive T cells, splenocytes and LN cells were pooled from each recipient, and recovery of transferred cells was analyzed by FCM. In analyses of human T cell recovery, the total number of each cell population was calculated from the total recovered cell number and the proportion of each human T cell subset among total recovered cells determined by FCM. Experiments were repeated three times with similar results. A, Representative FCM profiles of recovered splenocytes and LN cells from recipient humanized mouse that had 78.4% human chimerism (left panel) and control untreated NOD/SCID mouse that had no human chimerism (right panel) at the time of transfer, respectively. The frequencies of each gated population among total recovered cells are shown. B, Correlation analyses between human chimerism levels in T cell-deficient adoptive recipients at the time of transfer and recovered total (left panel), CD4 (middle panel), and CD8 T cell number (right panel) 14 d posttransfer. Recovered cell number was calculated from the total recovered cell number and the proportion of each T cell subset. C, Correlation analyses between human chimerism levels of adoptive recipients at the time of transfer and recovered cell number of rapidly (open circles) or slowly proliferating population (closed circles) of CD4 (left panel) or CD8 (right panel) T cells from each individual recipient mouse. Slowly and rapidly proliferating cells were defined by ≤6 and ≥7 divisions, respectively, based on CFSE intensity. Regression lines, r value, and p value of correlation coefficient test are shown in each figure (B and C). The recovery of both rapidly and slowly proliferating T cell populations correlated with the level of human chimerism present in the recipients at the time of adoptive transfer (Fig. 3C). The slope of this linear relationship was slightly higher for rapidly than slowly proliferating CD8 cells (0.09348 and 0.04243, respectively). Although the number of rapidly proliferating CD4 cells also showed a strong correlation with the level of human chimerism, the slope of this relationship was much higher (1.368) than that of the slowly proliferating population (0.1948). These results imply that distinct stimuli control the expansion and/or survival of separate CD4 and CD8 cell populations in the periphery of recipient T cell-deficient humanized mice (Fig. 3C). To determine whether the T cell proliferation rate, in addition to cell recovery, correlated with the level of human chimerism in adoptive recipients at the time of cell transfer, we examined the number of T cells that had undergone a given number of divisions in relation to chimerism levels in adoptive recipients. As shown in Table I, the proportion of T cells that underwent zero to more than seven divisions in five individual adoptive recipients was overall quite similar and did not correlate with the levels of human chimerism in these recipients. The mitotic index, which is the average number of mitoses each original precursor underwent, was also similar among all recipients and did not correlate with the level of chimerism. Rapidly proliferating murine T cells generally convert to the memory phenotype under lymphopenic conditions (7, 29, 30). To investigate whether similar phenotypic changes affect human T cells proliferating in a T cell-deficient environment, we used multicolor flow cytometry to analyze T cells recovered from the spleen and LNs of recipient humanized mice 14 d after adoptive transfer of naive autologous human T cells from Thy/Liv-grafted/CD34+ FLC-recipient humanized mice. As shown in Fig. 4, CD45RO expression was increased on recovered CD4 T cells that underwent rapid proliferation as defined by ≥7 divisions. CD45RA and CCR7 expression were downregulated on a high proportion of rapidly proliferating CD4 T cells. In contrast, very few CD4 T cells undergoing slow proliferation, which was defined by six or fewer divisions, showed upregulation of CD45RO or reduced expression of CD45RA and CCR7. A similar pattern of phenotypic conversion was also observed for recovered CD8 T cells. Rapidly proliferating T cell population adopts memory phenotype, whereas slowly proliferating T cell population retains the naive phenotype. Naive human T cells isolated from humanized mice receiving Thy/Liv grafts/CD34+ FLC 20 wk earlier were CFSE-labeled and transferred into T cell-deficient recipient humanized mice. Pooled splenocytes and LN cells from each individual recipient mouse were analyzed 14 d posttransfer. In analyses of human T cell phenotype, human T cells were enriched by negative selection using anti-mouse CD45, Ter119 microbeads, and the human Pan-T cell isolation kit II by MACS and analyzed by FCM. Results are shown from one representative experiment (n = 5 mice) of three experiments. CFSE intensity and expression of indicated markers of recovered CD4 (upper panels) and CD8 (lower panels) T cells from one representative recipient mouse are shown. When the proportion of memory-type cells (CD45RA−) among recovered human CD4 T cells was plotted against the level of human CD14+ cell chimerism of the recipient, which is indicative of the level of myeloid APC repopulation in the periphery, a sigmoid correlation was detected (Fig. 5). The memory conversion rate of CD4 T cells correlated directly with the level of human CD14+ cell chimerism of recipient mice with relatively low levels of human CD14+ cell chimerism (p < 0.05) and reached a plateau of ~80% at relatively high levels of human CD14+ cell chimerism. On the other hand, the proportion of memory-type cells among recovered human CD8 T cells did not correlate with the levels of CD14+ chimerism in adoptive recipients (p > 0.05; Fig. 5). The memory-like conversion rate of CD8 T cells was ~80–90% at all levels of human CD14+ cell chimerism. 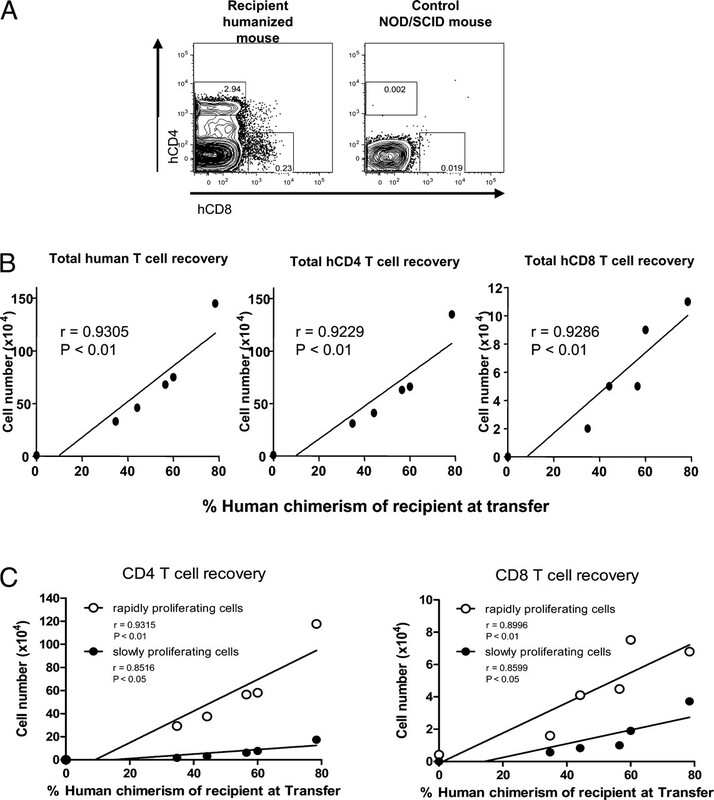 In contrast, when the proportion of memory-type cells among recovered human CD4 and CD8 T cells was plotted against the level of human CD19+ cell chimerism of the recipient, a significant direct correlation was detected only for CD8 T cells but not for CD4 T cells (p < 0.05 and p > 0.05, respectively; Fig. 5). These results suggest that myeloid APCs may be most important in driving CD4 T cell conversion, whereas B cells may be the most important APCs driving CD8 T cell conversion in a T cell-deficient environment. Memory conversion of naive CD4 and CD8 T cells correlates with different types of APC in the periphery of adoptive recipient T cell-deficient humanized mice. 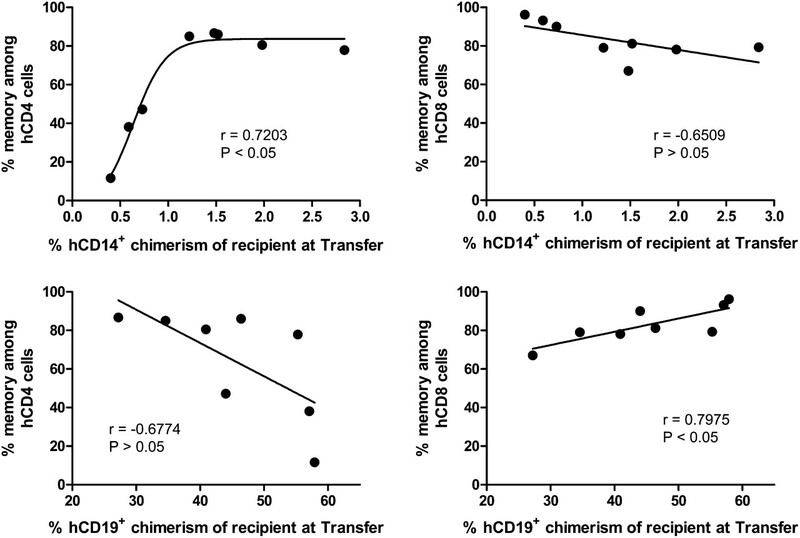 Correlation analyses between percentage of human CD14+ (upper panels) or CD19+ (lower panels) chimerism levels in recipient T cell-deficient humanized mice at time of transfer and percentage of memory-type cells among recovered total CD4 (left panels) and CD8 (right panels) T cells 14 d posttransfer are shown (n = 8 mice). Percentages of memory-type cells were calculated from the proportion of memory (CD45RA−) cell subsets among CD4 and CD8 T cells determined by FCM. Best fitted curve calculated using sigmoid dose-response model is shown for comparison between percentage of human CD14+ cell chimerism level and percentage of memory-type cells among recovered CD4 T cells. Linear regression model is used for other comparisons. R value and p value of correlation coefficient test are shown in each panel. Results are shown from the combination of two similar experiments. To further analyze the relationship between cell proliferation and phenotype, we analyzed CD45RA and CCR7 expression on T cells to distinguish phenotypes that have been defined in vitro for human T cells (31). As reported, CD45RA and CCR7 expression on T cells can distinguish naive, central memory (CM), effector memory (EM), and EMRA phenotypes of T cells (Fig. 6A). As shown in Fig. 6A and 6B, rapidly and slowly proliferating T cell populations showed different phenotypic distributions. A large portion of rapidly proliferating CD4 T cells expressed the CM (CD45RA−CCR7+) or EM (CD45RA−CCR7−) phenotype (49.6 ± 6.3% and 37.8 ± 8.1%, respectively). On the other hand, a large portion of slowly proliferating CD4 T cells expressed the naive phenotype (CD45RA+CCR7+; 80.3 ± 6.3%). Similar patterns were also seen for each population of CD8 T cells, with significant differences in the distribution of naive, CM, and EM subpopulations among rapidly and slowly proliferating populations (p < 0.001; Fig. 6B). These results indicate that human T cells undergoing rapid proliferation in a T cell-deficient environment acquire the memory phenotype, whereas slowly proliferating human T cells retain the naive phenotype. Detailed phenotypic analysis of rapidly and slowly proliferating cells. A, Phenotypic characteristics (CD45RA and CCR7 expression) of rapidly and slowly proliferating population in recovered CD4 (left panel) and CD8 (right panel) T cells from the same representative recipient mouse as shown in Fig. 4. The cell frequencies in each quadrant are shown. B, Comparison of phenotypic distribution of rapidly (open bars) and slowly proliferating populations (closed bars) among recovered human CD4+ (left panel) and CD8+ (right panel) T cells. Naive, CM, EM, and EMRA subpopulations were defined as CD45RA+CCR7+, CD45RA−CCR7+, CD45RA−CCR7−, and CD45RA+CCR7−, respectively, as shown in A. Slowly and rapidly proliferating cells were defined by ≤6 and ≥7 divisions, respectively, based on CFSE intensity. C, Comparison of CD25+ (upper panel) and CD69+ (lower panel) cell distribution among rapidly (open bars) and slowly (closed bars) proliferating populations of recovered human CD4 and CD8 T cells. *p < 0.05; **p < 0.01 comparing rapidly and slowly proliferating populations in each T cell subpopulations (paired t test); ***p < 0.001 comparing rapidly and slowly proliferating populations in each subpopulation (two-way ANOVA, Bonferroni posttest). Although the percentages of CD25+ cells were small, there was a significantly greater proportion of CD25+ cells in the rapidly proliferating compared with the slowly proliferating CD4 T cells, and CD25 expression was only apparent among the rapidly proliferating subset of CD8 T cells (Fig. 6C). Upregulation of CD69 expression was also observed among rapidly and slowly proliferating CD4 T cells, again to a greater extent in the rapidly proliferating population, and occurred to a significant extent only for the rapidly proliferating population of CD8 T cells (Fig. 6C). Thus, a small proportion of rapidly proliferating transferred T cells expressed activation markers, such as CD25 and CD69 on day 14 posttransfer, possibly reflecting Ag recognition. Rapidly proliferating murine T cells in a lymphopenic environment acquire the capacity to produce IFN-γ during conversion to the memory phenotype (9). To determine whether the same was true for human T cells, we next investigated IFN-γ production by rapidly proliferating human T cells in T cell-deficient recipients. Naive autologous human T cells from Thy/Liv-grafted/CD34+ FLC-recipient humanized mice were labeled with CFSE and transferred to T cell-deficient humanized mice. Fourteen days posttransfer, we recovered T cells from the spleen and LNs of adoptive transfer recipient mice, stimulated purified human T cells with PMA and ionomycin for 4 h in vitro, and analyzed their IFN-γ production as well as their CFSE and phenotypic profiles using multicolor FCM. Prior to performing these experiments, we demonstrated that 4 h in vitro stimulation with PMA plus ionomycin did not alter the CFSE profile of labeled human T cells (data not shown). For our analyses, we considered CD3+CD8− T cells to be presumptive CD4 T cells because stimulation with PMA plus ionomycin caused reduced surface expression of the CD4 molecule, as previously reported (32). When recovered T cells were stimulated in vitro, rapidly proliferating CD3+CD8− and CD3+CD8+ T cells produced high levels of IFN-γ (Fig. 7A); 13.03 ± 3.77% of rapidly proliferating CD3+CD8− T cells, and 56.69 ± 4.26% of rapidly proliferating CD3+CD8+ T cells produced IFN-γ (Fig. 7B). In contrast, among slowly proliferating CD3+CD8− and CD3+CD8+ T cells, respectively, only 1.57 ± 0.67% and 6.35 ± 1.87% produced IFN-γ. To further analyze the relationship between IFN-γ production and cell phenotype, we analyzed CD45RA and CCR7 expression of the PMA-stimulated T cells to distinguish naive, CM, EM, and EMRA phenotypes, which have been shown in vitro to be associated with cytokine production upon stimulation (31, 33). As shown in Fig. 8A and 8B, the majority of slowly proliferating CD3+CD8− and CD3+CD8+ T cells maintained the naive phenotype (CD45RA+CCR7+), whereas the majority of rapidly proliferating CD3+CD8− T cells and CD3+CD8+ T cells retained the memory phenotype (CM, EM, or EMRA) poststimulation with PMA plus ionomycin. The only change observed was a decreased proportion of CM T cells and an increased proportion of EM T cells in the rapidly proliferating population compared with prestimulation phenotypes. However, the proportion of naive and EMRA cells did not change upon in vitro stimulation. 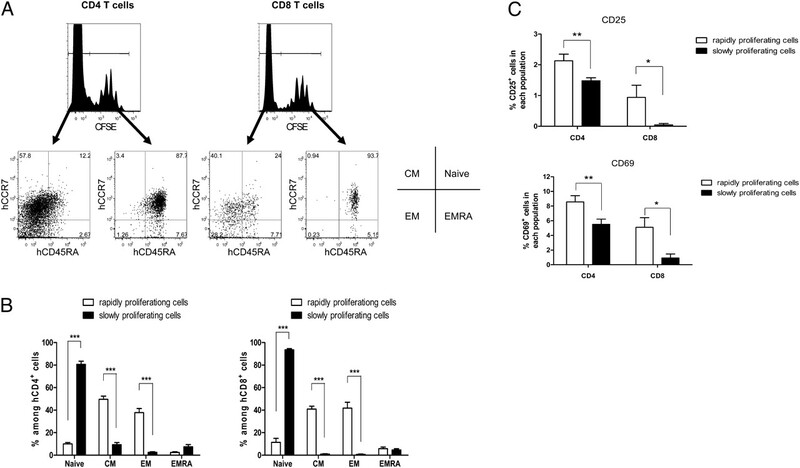 These results suggest that human CM-type T cells differentiated to EM-like T cells upon stimulation, as described in previous in vitro studies (31, 34). Furthermore, among the rapidly proliferating CD3+CD8− and CD3+CD8+ T cells, the EM-like subpopulation (CD45RA−CCR7−) showed the greatest production of IFN-γ, whereas the naive-type subpopulation (CD45RA+CCR7+) showed the lowest level of IFN-γ production upon restimulation (Fig. 8C). Thus, the rapidly proliferating human T cell population can acquire the capacity to produce IFN-γ upon restimulation in vitro, and this capacity is strongly associated with the acquisition of a memory phenotype. Only rapidly proliferating T cells rapidly produce IFN-γ upon in vitro stimulation. Adoptive recipient mice were sacrificed 14 d posttransfer of donor human naive T cells, and splenocytes and LN cells were pooled from each individual mouse. For in vitro stimulation, mouse CD45−Ter119− human T cells were isolated from pooled recovered cells by MACS. Isolated human T cells (105/well) were stimulated with PMA (20 ng/ml), ionomycin (1 μM), and brefeldin A for 4 h. Stimulated cells were stained for surface markers and cytosolic content of IFN-γ. Results are shown from one representative experiment (n = 5 mice) of three experiments. A, CFSE and IFN-γ profiles of stimulated human CD3+CD8− (left panels) and CD3+CD8+ (right panels) T cells from one representative recipient mouse, and the frequencies in each quadrant are shown. B, Comparison of IFN-γ+ cell distribution among rapidly and slowly proliferating populations of recovered human T cells. Open bars and closed bars represent percentage of IFN-γ+ cells among rapidly and slowly proliferating populations, respectively. Slowly and rapidly proliferating cells were defined by ≤6 and ≥7 divisions, respectively, based on CFSE intensity. All data are expressed as mean ± SEM of percentage of IFN-γ+ cells among CD3+CD8− or CD3+CD8+ T cells. *p < 0.05; ***p < 0.001; compared between rapidly and slowly proliferating populations in CD3+CD8− and CD3+CD8+ T cells, respectively (two-way ANOVA, Bonferroni posttest). Relationship between acquired memory phenotype and capacity for IFN-γ production. Adoptive recipient mice were sacrificed 14 d posttransfer, and isolated human T cells were stimulated with PMA, ionomycin, and brefeldin A for 4 h. Stimulated cells were stained for surface markers and cytosolic content of IFN-γ. Results are shown from one representative experiment (n = 5 mice) of three experiments. A, Phenotypic characteristics and IFN-γ production from one representative mouse. CFSElo populations of CD3+CD8− (left panels) and CD3+CD8+ (right panels) T cells were further classified based on expression of CD45RA and CCR7, and IFN-γ production of each subset was analyzed. Histograms show IFN-γ production in indicated subpopulation. The bold line represents staining with anti–IFN-γ mAb, and the filled area represents staining with isotype mAb. B, Comparison of phenotypic distribution of rapidly (open bars) and slowly proliferating populations (closed bars) among recovered human CD3+CD8− (left panel) and CD3+CD8+ (right panel) T cells after in vitro stimulation with PMA plus ionomycin. Slowly and rapidly proliferating cells were defined by ≤6 and ≥7 divisions, respectively, based on CFSE intensity. Naive, CM, EM, and EMRA subpopulations were defined as CD45RA+CCR7+, CD45RA−CCR7+, CD45RA−CCR7−, and CD45RA+CCR7−, respectively. ***p < 0.001 comparing rapidly and slowly proliferating populations in each subpopulation (two-way ANOVA, Bonferroni posttest). C, Rapid IFN-γ production of rapidly proliferating T cells following stimulation is associated with the acquired memory phenotype. Open bars and closed bars represent percentage of IFN-γ+ cells among each subpopulation of rapidly proliferating CD3+CD8− and CD3+CD8+ T cells, respectively, upon in vitro stimulation. ***p < 0.001 compared with all other subpopulations, except for EMRA CD3+CD8+ population (one-way ANOVA, Bonferroni posttest). We have used a humanized mouse model to investigate HPE of human T cells in vivo. Our study design allowed an investigation of the fate of naive human T cells transferred into a T cell-deficient environment containing autologous APCs. The studies identified two distinct proliferation patterns for both CD4 and CD8 T cells and showed that the rapidly proliferating naive T cells acquired characteristics of effector/memory cells, whereas slowly proliferating T cells retained the naive phenotype. Only the rapidly proliferating cell population developed the capacity to rapidly produce IFN-γ following stimulation. The accumulation of rapidly and slowly dividing human T cells in the T cell-deficient environment was dependent on the presence of and showed a quantitative relationship with the number of human non-T cells in the environment. However, cell division rate did not correlate with the number of human APCs available in the periphery of humanized mice. By inference, these data suggest that human T cell survival may be more dependent than proliferation on the presence of human APCs in the periphery. Although methods of examining phenotypic conversion in vivo have previously been unavailable for human T cells, our results are consistent with those obtained for murine T cells, in which both rapid and slow proliferation also occurs in congenitally lymphopenic or T cell-deficient animals (9, 35, 36). In contrast, the proliferating population is dominated by slowly proliferating cells in mice with pre-existing immune systems in which lymphopenia is induced by lethal or sublethal irradiation or depleting Abs (36–39). Our adoptive transfer model replicates selective congenital T cell immunodeficiencies, because the adoptive recipients had reconstituted high levels of human B cells and APCs prior to transfer. Thus, our studies show that the presence of a rapid T cell expansion phase in congenitally immunodeficient recipients is consistent between mice and humans. It will be of interest to extend our model to an examination of the behavior of autologous T cells transferred to T cell-reconstituted humanized mice that receive T cell-depleting treatment prior to adoptive transfer. One of the most remarkable characteristics of HPE is phenotypic conversion to memory-type of the progeny of peripheral T cells undergoing expansion in the lymphopenic setting. This phenomenon has been observed for both CD4 (8, 9) and CD8 T cells (7–9, 29, 40, 41) in many studies using the CFSE-based adoptive transfer technique in mouse models. Conversion of naive T cells to the memory phenotype has also been suggested in the human system by observations of markedly increased ratios of memory to naive T cells following lymphoablative treatment (13–15). Nevertheless, these types of studies have not permitted distinction between the possibility that skewing toward the memory phenotype reflects expansion of residual memory T cells and the possibility that real phenotypic conversion to the memory type of naive T cells occurs during HPE in humans. Our data clearly demonstrate that naive human T cells can acquire an effector/memory-like phenotype in association with rapid proliferation upon adoptive transfer to congenitally T cell-deficient hosts. Although the failure of slowly proliferating naive human T cells to undergo phenotypic conversion during the short follow-up period of our studies (14 d) are consistent with results in the murine system (8, 9, 11, 36), studies in the mouse suggest that these cells eventually undergo conversion to the memory phenotype (42). Our studies show that the ability to recover human T cells following adoptive transfer into T cell-deficient humanized mice is strictly dependent on the presence of human non-T cells in the periphery. Moreover, the level of recovery of both rapidly and slowly proliferating human T cell populations correlated directly with the level of human peripheral non-T cell chimerism in the adoptive recipients prior to transfer. Thus, our study demonstrates the importance of homologous APCs for human T cells to expand or survive in the periphery of humanized mice. Recovery depends on both the survival and the proliferation of transferred T cells. The similar proportions of T cells that underwent each number of divisions in mice with markedly different percentages of human APCs suggests that survival may be affected to a greater extent than cell division by the presence of human APCs in this model. Dependence on autologous human APCs may explain the much higher levels of T cell reconstitution and function (skin graft rejection, etc.) observed when peripheral CD34+ cell injections are given along with fetal human Thy/Liv grafts than is observed with Thy/Liv grafts alone, in which peripheral APC repopulation does not occur (22). Furthermore, the number of rapidly proliferating CD4 T cells showed a stronger correlation with adoptive recipient human chimerism levels than slowly proliferating CD4 T cells, and the proportion of memory-type CD4 T cells was proportional to the level of recipient CD14+ cell chimerism. These results suggest that rapidly proliferating human CD4 T cells require interactions with self-MHC class II molecules on autologous myeloid-derived APCs for their expansion and survival, as shown in mouse models (9, 43). In contrast to CD4 T cells, in our study, memory conversion of CD8+ T cells correlated with peripheral CD19+ cell chimerism rather than CD14+ cell chimerism. These data suggest that rapidly proliferating CD8 T cells rely on B cells as APCs for Ag presentation, whereas CD4 cells rely on macrophages and myeloid DCs. Our overall observations are consistent with results in mouse models, in which rapid proliferation is inhibited by anti-MHC Abs, fails to occur in MHC−/− hosts, and is IL-7 independent but costimulation dependent (8, 11, 38, 44). This type of proliferation is much less prominent in germ-free hosts and appears to be directed to Ags from intestinal gut flora (39). In contrast, slow proliferation also requires MHC signals, specifically from the same MHC/peptide complex that mediated positive selection in the thymus (35, 38). These findings imply that rapid proliferation is likely supported by self-MHC plus cognate Ags from commensal bacteria, whereas slow proliferation is likely supported by self-MHC plus self-Ags. We observed that a significantly greater proportion of rapidly proliferating than slowly proliferating T cells upregulated acute activation markers, such as CD25 and CD69. This result is consistent with studies in the mouse (9, 12) and with the possibility that rapid proliferation is evoked by commensal Ag rather than self-Ag. What regulates slow proliferation of transferred human T cells in humanized mice? One possibility is that human IL-7 is secreted by DCs derived from the human fetal CD34+ cell donor, as IL-7 mRNA transcripts in human peripheral blood DCs and constitutive production of human IL-7 by monocyte-derived DCs in vitro have been described (45, 46). However, the major sources of IL-7 are believed to be non–marrow-derived stromal and epithelial cells (47). Another possibility is that the cross-reactivity on human cells (48) of mouse IL-7 secreted by host NOD/SCID tissues may regulate human T cells. Further studies are needed to address these hypotheses. To our knowledge, this is the first in vivo model to assess the dynamics of human T cells in HPE. We acknowledge that the immune system in our humanized NOD/SCID mouse model may not fully represent that in humans because nonhematopoietic tissues of the host are mouse-derived. However, this humanized mouse model has the advantage of permitting more detailed and in-depth experiments than are possible in human subjects. This model could allow development of methods to minimize the adverse effect of HPE on induction of organ allograft tolerance that has been suggested by mouse models (49, 50). The model also suggests that vaccination and adoptive transfer of T cells may provide the most durable antitumor responses if given in the immediate postlymphoablation period when Ag-driven responses are maximal (2–4). Therefore, the improved understanding of the cytokine and cellular mechanisms that contribute to the peripheral expansion of human T cells in lymphopenia that can be obtained with this humanized mice model may have important implications for clinical treatments, such as organ transplantation, hematopoietic stem cell transplantation, cytokine therapy, and antitumor immunotherapy. We thank Drs. Gilles Benichou and Jessica A. Sachs for critical review of this manuscript, Orlando Moreno for outstanding animal husbandry, and Kelly Walsh and Gena Coleman for expert assistance with the manuscript. This work was supported by National Institutes of Health Grant P01 AI045897. T.O. was supported in part by a Postdoctoral Fellowship for Research Abroad of the Japan Society for the Promotion of Science. 2000. T-cell immunodeficiency following cytotoxic antineoplastic therapy: a review. Stem Cells 18: 10–18.
. 2002. T cell homeostatic proliferation elicits effective antitumor autoimmunity. J. Clin. Invest. 110: 185–192.
. 2005. Age-dependent incidence, time course, and consequences of thymic renewal in adults. J. Clin. Invest. 115: 930–939.
. 1993. T-cell regeneration after bone marrow transplantation: differential CD45 isoform expression on thymic-derived versus thymic-independent progeny. Blood 82: 2585–2594.
. 2001. A closer look at homeostatic proliferation of CD4+ T cells: costimulatory requirements and role in memory formation. J. Immunol. 167: 3699–3707.
. 2005. Spontaneous and homeostatic proliferation of CD4 T cells are regulated by different mechanisms. J. Immunol. 174: 6039–6044.
. 2001. Dependence of lymphopenia-induced T cell proliferation on the abundance of peptide/ MHC epitopes and strength of their interaction with T cell receptors. Proc. Natl. Acad. Sci. USA 98: 1728–1733.
. 2004. T-cell homeostasis in humans with thymic hypoplasia due to chromosome 22q11.2 deletion syndrome. Blood 103: 1020–1025.
. 1997. Constraints on CD4 recovery postchemotherapy in adults: thymic insufficiency and apoptotic decline of expanded peripheral CD4 cells. Blood 90: 3789–3798.
. 1997. Enhanced human CD4+ T cell engraftment in beta2-microglobulin-deficient NOD-scid mice. J. Immunol. 158: 3578–3586.
. 2002. Functional human T lymphocyte development from cord blood CD34+ cells in nonobese diabetic/Shi-scid, IL-2 receptor gamma null mice. J. Immunol. 169: 204–209.
. 1993. The SCID-hu mouse as a model for HIV-1 infection. Nature 363: 732–736.
. 1993. HIV induces thymus depletion in vivo. Nature 363: 728–732.
. 2006. Reconstitution of a functional human immune system in immunodeficient mice through combined human fetal thymus/liver and CD34+ cell transplantation. Blood 108: 487–492.
. 2008. Antigen-specific human T-cell responses and T cell-dependent production of human antibodies in a humanized mouse model. Blood 111: 4293–4296.
. 2007. Porcine thymic grafts protect human thymocytes from HIV-1-induced destruction. J. Infect. Dis. 196: 900–910.
. 2005. CD11chigh dendritic cell ablation impairs lymphopenia-driven proliferation of naive and memory CD8+ T cells. J. Immunol. 175: 6428–6435.
. 2005. 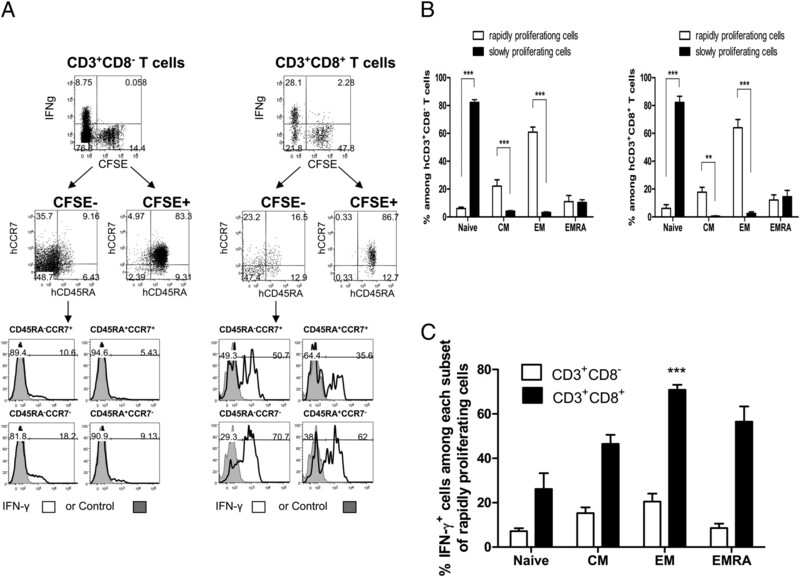 MHC class I-positive dendritic cells (DC) control CD8 T cell homeostasis in vivo: T cell lymphopenia as a prerequisite for DC-mediated homeostatic proliferation of naive CD8 T cells. J. Immunol. 175: 201–206.
. 2008. CD137 induces proliferation of murine hematopoietic progenitor cells and differentiation to macrophages. J. Immunol. 181: 3923–3932.
. 2008. Induction of proliferation and monocytic differentiation of human CD34+ cells by CD137 ligand signaling. Stem Cells 26: 2372–2381.
. 1999. Homeostatic expansion and phenotypic conversion of naïve T cells in response to self peptide/MHC ligands. Proc. Natl. Acad. Sci. USA 96: 13306–13311.
. 2007. Detection of intracellular cytokines by flow cytometry. Curr. Protoc. Immunol. Chapter 6: Unit 6.24.
. 2003. Proliferation and differentiation potential of human CD8+ memory T-cell subsets in response to antigen or homeostatic cytokines. Blood 101: 4260–4266.
. 2006. Self-recognition is crucial for maintaining the peripheral CD4+ T-cell pool in a nonlymphopenic environment. Blood 108: 270–277.
. 2006. CD25+CD4+ regulatory T cells and memory T cells prevent lymphopenia-induced proliferation of naive T cells in transient states of lymphopenia. J. Immunol. 177: 4558–4566.
. 2007. An intense form of homeostatic proliferation of naive CD8+ cells driven by IL-2. J. Exp. Med. 204: 1787–1801.
. 1999. The peptide ligands mediating positive selection in the thymus control T cell survival and homeostatic proliferation in the periphery. Immunity 11: 173–181.
. 2005. Recent immune status determines the source of antigens that drive homeostatic T cell expansion. J. Immunol. 174: 3158–3163.
. 2001. Il-12 enhances CD8 T cell homeostatic expansion. J. Immunol. 166: 5515–5521.
. 2000. Survival and homeostatic proliferation of naive peripheral CD4+ T cells in the absence of self peptide:MHC complexes. J. Immunol. 165: 2458–2464.
. 2003. On the role of MHC class II molecules in the survival and lymphopenia-induced proliferation of peripheral CD4+ T cells. Proc. Natl. Acad. Sci. USA 100: 6021–6026.
. 2004. A role for CD28 in lymphopenia-induced proliferation of CD4 T cells. J. Immunol. 173: 3909–3915.
. 1998. Human dendritic cells express functional interleukin-7. Immunobiology 198: 514–526.
. 2009. CD40 regulates human dendritic cell-derived IL-7 production that, in turn, contributes to CD8(+) T-cell antigen-specific expansion. Immunol. Cell Biol. 87: 167–177.
. 1990. Constitutive expression of interleukin-7 mRNA and production of IL-7 by a cloned murine thymic stromal cell line. J. Leukoc. Biol. 48: 205–212.
. 2006. Molecular and functional evidence for activity of murine IL-7 on human lymphocytes. Exp. Hematol. 34: 1133–1142.
. 2004. Homeostatic proliferation is a barrier to transplantation tolerance. Nat. Med. 10: 87–92.
. 2008. Homeostatic proliferation of lymphocytes results in augmented memory-like function and accelerated allograft rejection. J. Immunol. 180: 3910–3918.